Pork Bánh Mì dish, only served during lunch hours. Photo by Henry Nieberg ’19. This week, I tried a French-Vietnamese fusion restaurant called Ngon Vietnamese Bistro. Even though there are many good choices for Vietnamese food on the Green Line, this place compares to none other. The prices are a little steeper than the average Green Line restaurant, but the food will make you understand why. From the outside, Ngon Bistro is just unkempt restaurant which is very easy to miss when riding on the Green Line. However, when you enter the restaurant, the whole atmosphere changes. The restaurant has low dimmed lights with bartenders playing vinyl, immediately making the average college student feel classy. Since Ngon Bistro is a fusion restaurant, there are French dishes and Vietnamese dishes that borrow ingredients and cooking styles from each other. For example, the Croque-Madame ($13) (standard French ham and cheese sandwich with a fried egg on top) had phở braised pork belly instead. However, by far the two greatest dishes on the menu were the Pork Bánh Mì ($11) and the standard phở ($12). The Pork Bánh Mì is only served during lunch hours, so it is important to plan ahead if you are interested in trying this dish. Unlike traditional Bánh Mì, Ngon Vietnamese Bistro slightly toasts the bread to make the sandwich have an extra depth to Bánh Mì that I’ve never tasted before. With the combination of organic pork and duck liver pate and various other vegetables, this Bánh Mì is a must try if one is looking for good Bánh Mì or simply has never tried one before. 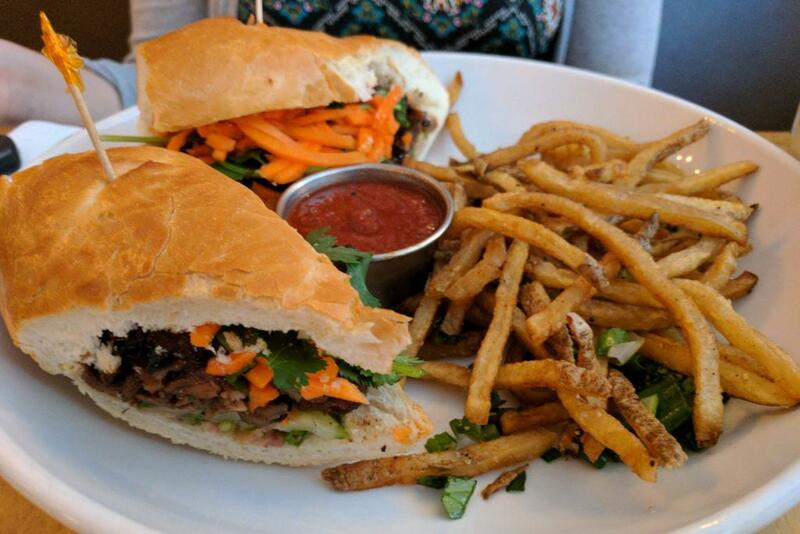 Both the Croque-Madame and the Bánh Mì come with french fries, heavily seasoned with herbs. The fries were definitely good, but couldn’t compare to the main dishes. The other dish I recommend is the phở ($12). It is possible to substitute the three beef for chicken, or for an additional dollar add meatballs or even ribeye. The broth is phenomenal because it is simple. I could instantly tell that the broth is only made from the highest quality meats and vegetables. However, the broth is excellently accompanied with the housemade chili sauce. While it might be spicy to a typical Minnesotan, the soup becomes infinitely better with it. View of the bar, with a variety of spirits and vinyl. Photo by Henry Nieberg ’19. Unlike other restaurants I have reviewed for this column, Ngon Bistro isn’t very cheap, nor does it give huge portions. However, there is no doubt in my mind that this has to be one of the best restaurants I have tried in my time living in the Twin Cities, on or off the Green Line. If you ever feel like having a romantic date or simply want to feel classy for a night, I recommend heading over to Ngon as soon as you can. Ngon Vietnamese Bistro is located at 799 University Ave W, St Paul, MN 55104.